TST is the most advanced completion water jetting technology today. TST uses high pressure abrasive slurry to cut the casing, the cement, and deep into the formation. Two vertical windows, each going out 6 to 15 feet, about 1 to 3 inches wide, and as vertically tall as necessary. TST is very different from shaped charge perforation because it is a cutting procedure. No explosion, or burning, or scarring, or lamination. 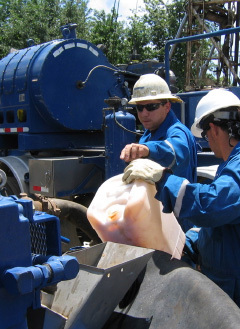 TST can be used as an alternative to hydraulic fracturing. We use a device called a centrator to orient the tool according to any depth, vector, or angle. TST is very accurate and reliable. The centrator ensures the cut is perpendicular to the maximum stresses of the porosity matrix. At this point in the procedure, permeability is already 15 to 20 times higher than before. Now, we can insert chemistry directly into the window cavities if necessary, to further increase permeability. Note – we only use slurry and chemicals that are absolutely safe for the wells geology. Risks of failing to cut are minimal, even for multiple casings and cement. Equipment is designed for deep cuts. Cutting and orientation ability can be demonstrated on surface prior to job. Depending on size, depth, number of terra-slices, and complexity of the job, costs are variable. However we provide an economic model outlining the cost benefits analysis. 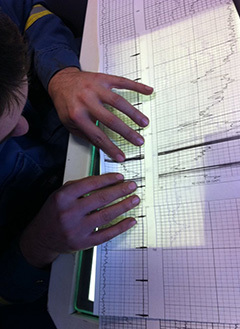 Risk and cost can be reduced further by consulting with experienced engineering and geological team of FalconRidge Oil. So technically what do we do? We start with an existing oil and gas asset. compression around the well-bore, and move it to the tips of the slots. what exists in nature. Permeability at the tips goes to zero. wide in the target interval. This allows the well to access reserves far beyond what was previously accessible. Your low production goes way up. Your dead well becomes revived. By working with FalconRidge, we will enhance productivity, increase revenue, and extend the life of current oil and gas assets.